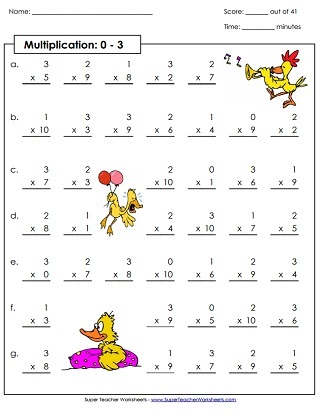 These printable worksheets and activities focus specifically on the 3s multiplication facts. This page has a 3s multiplication wheel, comparing questions, skip counting, and a table for students to fill in. This mystery picture has all of the 3s times tables. Answer the math facts and color. Multiply by 3 and write the answers. Then color the picture according to the key at the bottom of the page. Finished picture is a sailboat. Students will practice their multiplication facts with the numbers 3 and 4 with this puzzle activity. Multiply by 3s to fill in all the bubbles on the multiplication caterpillar. Create an origami cootie catcher (aka "fortune teller"). Kids can use it to learn and review basic facts. Determine the number of fish, flowers, crayons, and snails by counting by 3s. Up to 27, which coincides with 3x9. Count by 3s and then answer the critical thinking questions. Count by 3s up to 36. These numbers coincide with multiplication facts up to 3x12. 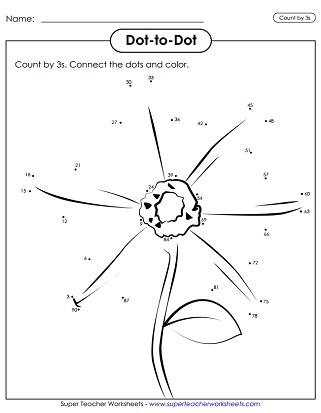 Skip count by 3s to make a beautiful flower picture. Start at number 3 and keep drawing until you get all the way up to 90. Count by 3s and write the numbers on the penguins' bellies. Numbers up to 78. Count by 3s and write the numbers on the balloons. Numbers to 72. Count by 3s on the hundreds chart. Color every 3rd number. Then tell if the numbers are odd, even, or both. This worksheet has 41 multiplication facts, for 0s, 1s, 2s, and 3s only. Facts through 10, up to 3x10. Answer over 40 multiplication facts, with factors of 0, 1, 2, and 3. Facts through 12, up to 3x12. This 50-question quiz has all multiplication facts for 0s, 1s, 2,s and 3s. Facts through 12, up to 3x12. Here you'll find lots more multiplication worksheets, games, and activities for all basic facts up to 10x10. 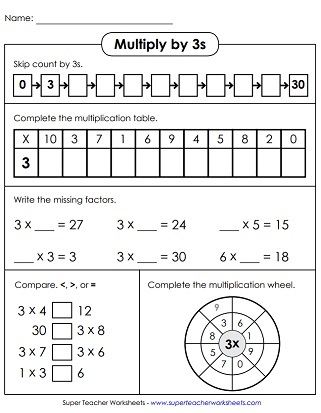 This page has lots of worksheets with multiplication and division fact families. These worksheets focus specifically on the 4s times tables.